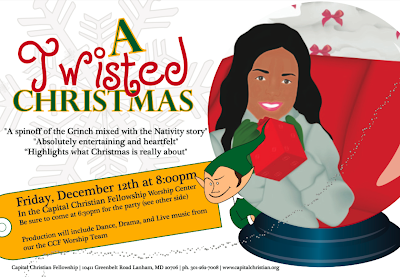 CCF Christmas Production, "A Twisted Christmas"
Dance Ministry and Worship Team are hard at work to prepare a special Christmas Production for us on Friday evening, December 12th immediately following the Christmas Party. Really looking forward to a great night! Flyer invitation just arrived from the designer today. Here it is. You are the first to see it. There will be plenty for you to pick up at church over the next few weeks.